I make chicken liiiike...a lot. And I eat it almost every day. Why? I'm picky and I need protein, k?! Anyway, so, obviously...I try to mix it up a liiittle by finding different chicken recipes. This one by How Sweet sounded healthy, different, and delish. Michael loved it too so, big hit all around! Sooo, I'm not super in love with breakfast food--I know I know! Don't worry, I always eat breakfast, but it's always like peanut butter toast, fruit, green monster smoothie, etc.-just because I know it's good for me. The only other like big breakfast foods I like....well...they taste like dessert. Cinnamon Rolls. Muffins. 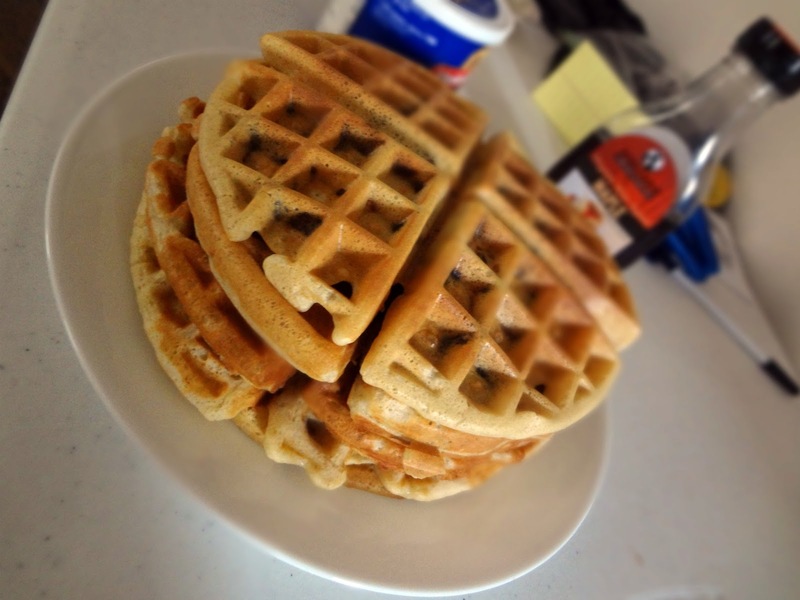 Pancakes and waffles--BUT--only if they have chocolate chips and I spread peanut butter over them. I wasn't always this way, I used to kind of like the classic butter and syrup combo. But now that I can have a breakfast with one of my flavor combinations, it's done for. Anyway, one day I wanted waffles! And I wanted to use what I had! But I didn't want them to be boring! So, after poring over the internet and thinking a bit, I sort of Frankenstein-ed this recipe together. They're healthier (I have to make up for my pb chocolate weakness) and light yet substantial (as a result of the whipped egg whites + oats). They're delishums! Crock-Pot Chicken-Again-Holiday Recipe Exchange: Week Three (Crock Pot/Slow Cookers). Triple Layer Oreo Bars-Take 2: Holiday Recipe Exchange: Week One (CHOCOLATE)! I know-you must be flabbergasted. So many recipes in such a short amount of time! 2 chocolate desserts in a row! Well, this is due to that Holiday Recipe Exchange I talked about in my last post. We are able to submit 2 recipes per week, and this is my second. I had leftover Oreo cookies from the Raspberry Cake-Pie, and I had a recipe of How Sweet's that was on my list to make (this list probably contains like 200 recipes or so). These are sooo good. They taste kind of like the Oreo Balls I made but in bar/brownie form. Go-make them! Enjoy the num num numminess! Chocolate Decadence-Holiday Recipe Exchange: Week One (CHOCOLATE)! Brown Sugar Roasted Chicken- Michael's birthday dinner! Cooking Actress original. Referencing How Sweet it Is and Heat Oven to 350 for inspiration.